Ask anyone who has rescued an animal from a bad situation or adopted an animal from a shelter, and they will tell you that there is something special about their pet. Animals that are rescued almost seem to know they have been given a second chance. In a bad economy, people have to make hard decisions when it comes to their pets. When they are out of work, become ill, or for some other reason can’t take care of their animals, the kindest thing to do is turn them over to a rescue organization to find them a new home. There are numerous no-kill shelters in the area where relinquished animals can live, either in the facility or in foster homes, until they are adopted. These are generally non-profit, volunteer-run organizations where caring people donate time and money to help the cause. In most cases, these organizations are continually in need of more foster homes, volunteers, funds and in-kind donations. Of course, adopting an animal is a wonderful way to help the cause. This creates an opening for another animal in need, and the adoption fees paid go toward spaying/neutering, veterinary care, food and other costs associated with taking care of the animals. Here we give you the saving-grace stories of three compassionate individuals who adopted from area animal rescue leagues. In the spring of 2010, The Grace Foundation of Northern California, a horse rescue organization, contacted Malinda Kregoski, owner and horse trainer at Equine Unlimited, Inc., and invited her to participate in a special program called The HELP Rescue Me Trainers Showcase. Kregoski and 31 other trainers took in a total of 50 horses from The Grace Foundation, trained them for 70 days, and then showed off their accomplishments during the Showcase that June. Kregoski accepted two horses through the challenge and won her category on a four-year-old quarter horse named Havannah. She was given the opportunity to adopt her after the challenge, which she happily did. Havannah is now a valued part of Kregoski’s lesson and summer camp programs, helping children learn how to ride and giving pony rides at birthday parties. The other horse Kregoski trained for the challenge, Cammy, went on to be adopted by another person. The purpose of The HELP Rescue Me Trainers Showcase is to raise awareness of rescue horses, showing that there are some very nice horses available. Some have come from abuse or neglect, some have come from the Bureau of Land Management wild horse roundups, and others were simply turned over because the owners faced financial difficulty and could no longer care for them. The horses in the program are more adoptable because they are trained and therefore more desirable. Ginny Ott has been volunteering at the El Dorado Humane Society for about a year, and she had no intention of taking home any more cats to join the two she already had at home. Ott feels it’s important to adopt animals from the Humane Society instead of through ads or breeders. “They may not be the most beautiful, but they’re the ones that need the love the most,” she explains. In March of this year, she succumbed to temptation and happily agreed to adopt Mooch, age 11, and Joaquin, age six. The cats had been living at the shelter since before it moved to its current location on Pleasant Valley Road in 2008. In fact, they had lived at the shelter for longer than any of the current volunteers have worked there, so no one knows how they first arrived. Four years ago, Cindy Flaherty and her family were driving home from vacation when she stopped at the PAWED shelter in Shingle Springs. 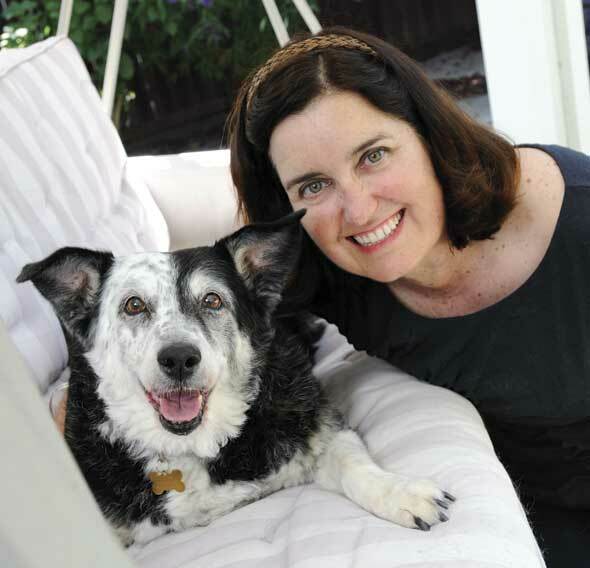 They saw a flyer advertising a border-collie-mix named Clover and fell in love, but they waited a couple of days to “think about it” before adopting her. Flaherty’s sons were so excited that night they couldn’t sleep, and she called PAWED back the next day. Clover, now 11 years old, has been through a lot, having had several owners in her life. Most recently, a teacher found her on the school playground and couldn’t keep her. PAWED President Charlene Welty fostered Clover because she wasn’t doing well in the loud shelter environment. However, she was just perfect for Flaherty’s family. “We were only looking for dogs that were five or older,” Flaherty explains. “Our younger son was five at the time, and he was intimidated by the puppies jumping on him…Clover is so mellow,” she says. 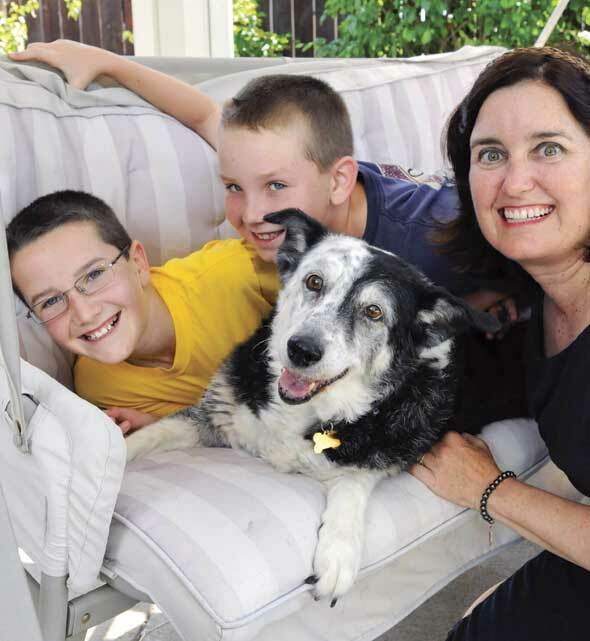 Because of what Clover means to her family, at PAWED’s request, Flaherty recently told their adoption story in her testimony before the county Board of Supervisors advocating for the building of the planned permanent animal shelter.